Key Technology, Walla Walla, WA – and with European offices in Beusichem, the Netherlands, and in Hasselt, Belgium – has introduced the highest capacity digital sorter in the food processing industry: the new VERYX® B210. With an inspection area over 2m wide, the belt-fed machine maximises throughput on high-capacity lines. 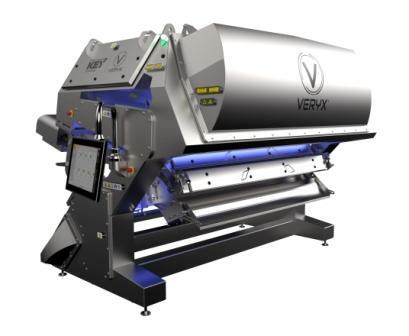 Like all sorters in the VERYX family, the B210 features advanced detection technology and an innovative system architecture that improve sorting accuracy. Recognising objects’ colour, size, shape and/or structural properties, these sorters remove foreign material (FM) and product defects to improve product quality while virtually eliminating false rejects to increase yields. Featuring a 2100mm wide inspection zone, VERYX B210 offers a production capacity in excess of 23t/h, depending on the application. “In many food processing plants, there is a trend toward new, higher capacity production lines, as well as efforts to maximise throughput on existing line installations. Our VERYX B210 supports both of these scenarios. In some layouts, the B210 is capable of replacing two smaller capacity sorters to make the line flow more efficient,” said Marco Azzaretti, advanced inspection systems product manager at Key.